Throughout time, life in the rainforest has been a mysterious and interesting subject. Most people would think water, trees, and animals; what's there to know? 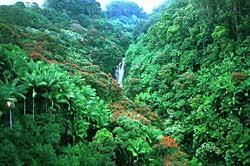 Then again, to others the rainforest would seem like a paradise, a place to escape to. The reality is that the rainforest is a wonderful place, home to millions os species of animals, plants, and sources for modern day medicines we use. However, although rainforests are an amazing resource and home to 2/3 of the animals populations on earth, deforestation threatens to destory it. Right now, we are here to learn about the roles of the mammals, amphibians, and bird species in the rainforest and how they interact with their environment. To really understand how animals react with their environment you hve to understand where they live. There are four "layers" in the rainforest. The emergent layer is the top layer where the tops of trees recieve the most sunlight. The canopy is the next layer under the emergent layer. This is where the smaller, yet extremely tall, trees grow. The canopy is also home to many birds, plants, and reptiles. The next layer or the "middle layer" is called the understory. Here, there are many small trees ferns and plants. The canopy will block out most of the sunlight so that the understory doesn't receive much light. however, there are still many animals and birds that prefer the understory. The final layer is the Forest Floor. Because of the other three layers no sunlight reaches the Forest Floor. Understandably almost no plants live on the Forest Floor. Althought many animals make their home here and get nourishment and housing from the plants that fall from the higher layers. On the next pages you will learn about mammals, birds, and amphibians that live in the rainforest.